When you're a hero, you tend to make a few enemies. Such is the case with Zorro, a hero dedicated to aiding the helpless and punishing cruel politicians. When you’re taking on people in power like politicians, it’s better that you keep your identity a secret, which is why Zorro wears his iconic mask. 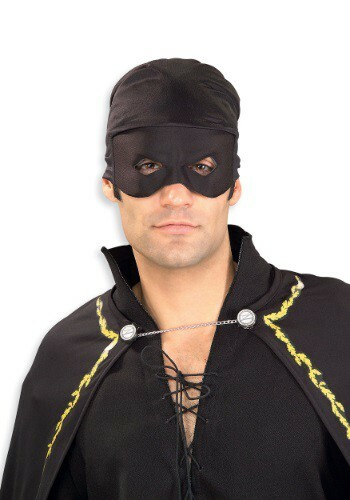 If you’re planning on dressing up as Zorro for Halloween, be sure to get this adult Zorro bandana with mask as it will be a vital part of your costume. This mask is just like the one used by the Spanish Fox, so you can be sure that enemies won't know who you are while you dash through the night, defeating villains. OK, maybe you’re not going out to avenge the helpless, but you might be going out to a Halloween costume party. If that’s the case, you might end up doing something completely embarrassing that you don’t want people to remember. We always advise people to play it safe on Halloween but, if you wind up in this situation, this Zorro bandana with mask should keep people from recognizing you in your moment of humiliation.